A helpless parent walking into the chamber of Ashoka Sarma was a life-changing experience for her. This one incident left her wise than before. Ashoka, like any other academician, opened a school in the year April 2003 – Bal Bhartis Public School in Guwahati. “Though it is not affiliated to CBSE, but we follow the Board. I am the founder-member of the school and in 2005 I formed a trust – Bal Bharti Educational Trust – registered under the Society Act. Mine was just a usual school with mainstream students till in the same year in August, the said hapless parent walked in with their autistic girl child,” she says. Till then, Ashoka had never heard about autism. “The parents explained to me what the child was going through and their horrific experience – how no school was ready to admit her. Heartbroken, I decided at that moment to admit the child (and read more such children) with special needs.” That one moment hit Ashoka very hard and brought about a significant change in her personality and changed her perspective and the way to look at things. It was a very touching incident for her that altered the very core of her faith and beliefs. It was a kind of coincidence that when this dynamic lady decided to admit special needs children, the National Institute of Public Cooperation and Child Development (NIPCCD) had organised a two-day workshop for teachers in 2003 in Guwahati (read which they do every year) and Ashoka had attended the same. Down the years, she has attended two more such workshops conducted by the institute in the city. Recently, she has been conferred with the Bookland Teachers’ Excellence Awards – 2018, at an event held in Guwahati (Assam), for her selfless service and contribution towards the society. Veena Malhotra, an entrepreneur, who is also a “close friend” of Ashoka and has been with her since the school started, puts in, “Ashoka’s love and passion for special needs children has struck a chord even among the teachers.” Vouching for Veena, Ashoka says that she got a lot of “inspiration and guidance” from her and she learnt from her friend how to teach computer to these CWSN students. 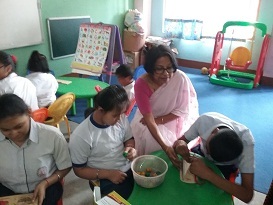 She exults, “My biggest success is that the mainstream students have learnt how to cope up with these special children, living together without any differences – they play together, help them eat their lunch and take them to the washroom, help them copy notes, take out books from their bags, etc. Parents of special kids come and tell me that they are not accepted in the neighbourhood, but in the school they are.” However, it “pained” Ashoka when three years back few parents pulled out their children (read mainstream) from her school because “we had children with special needs”. But, the woman of substance took it in her stride, “and today we have CWSN students from places as far as Darrang, Hojai, Golaghat, Jorhat and several other places of Assam. The mothers have been staying in rented houses with their children so that they can attend our school. It seems the doctors have referred (read for education) these special kids to our school. This gives me a sense of great satisfaction,” she remarks. Ashoka was against the idea of having a separate class for the special kids and decided that they would sit in the same classroom with the mainstream students. Her point is that – “Since the other schools refused to take them, so how would these children get a normal childhood with normal school experience.” To further give them a feeling of belonging, the Principal and the teachers have lunch with these special kids. Do they sit for the exams? “We have different set of questions for the special children – all objective types. The syllabus remains the same and they do fairly well. Later on, they sit for the National Institute Open Schooling (NIOS) secondary examinations under the HRD Ministry. A number of CWSN students have passed out from our school. Our students have also participated in the Special Olympics (Guwahati chapter) and three of them have played in the national level too,” says an elated Ashoka. Her “greatest concern” is that most parents are not aware that they have to make a social welfare card for their CWSN child and the school counsels them about the same. The school brings out the talent of these children when it comes to plays, dance and singing in various functions in Guwahati and they have performed for the local television channels. Her biggest acknowledgement till date? “Three doctors from NIMHANS, Hyderabad, made a surprise visit to our school in 2016 to see how we work with CWSN students. They went back satisfied and based on their report; the HRD Ministry had sent desks, chairs and computers for us. And, all this we achieved without any Government help or aid from outside sources,” she states with a smile. Workshops are held for parents from time to time and very soon a yoga centre will be opened in the school for learning disabled children. Future plans? “To open a home for learning disabled adults,” affirms Ashoka. As I left the school precincts, I was impressed seeing special needs children participating in all kinds of pastimes in the playground along with the mainstream ones and the latter cooperating with them with full gusto.